The iPad Camera connection kit is a very handy accessory for your iPad that allows you to import photos from your digital camera to your iPad. 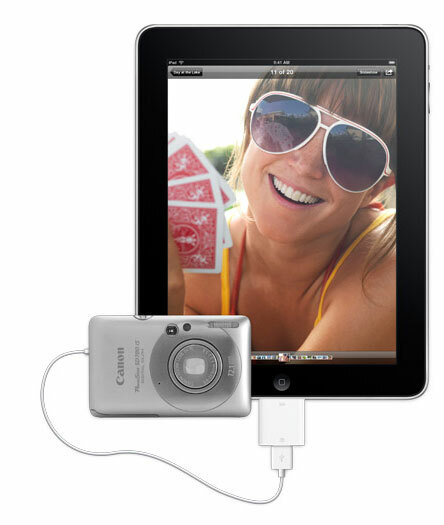 There are two methods available, one is a direct connection to your digital camera or you can use the SD card adapter which also directly plugs into your iPad. As a PC person, I was surprised at how easy it was to use and all you needed to do was plug the adapter into the dock connector port on your iPad. Then you had to turn on your digital camera and presto, select what photos you want to import to your iPad. It was also the same procedure from your SD card to your iPad. Just be warned that it does not support all digital cameras, however if your camera supports the Picture Transfer Protocol (PTP) or can be classified as a mass storage device, then you shouldn't have any problems. Generally, just about all cameras support these standards. In conclusion, Apple have created a very impressive accessory for your iPad that is perfect if your away from your home or office and have no Mac/PC access. It's not for everyone but for those who need it, a definite godsend!